A formal agreement with the US Department of Energy (DoE) means that Babcock & Wilcox (B&W) mPower can access the first $79 million of federal funding under a government program to accelerate commercialization of small modular reactors (SMRs). The mPower America team of B&W, the Tennessee Valley Authority (TVA) and B&W subsidiary Generation mPower was selected in a competitive process to receive DoE funding to commercially demonstrate the mPower SMR by 2022. Now that the cooperation agreement has been signed, the $79 million allocated for the first year of the program will be available immediately to the B&W mPower program. DoE is expected to make a total of about $150 million available during the five-year period of the award. The cooperative agreement also allows for further federal funding of $226 million "or more", B&W notes. The company says it intends to use any further funding for licensing and engineering activities. DoE assistant secretary for nuclear energy Peter Lyons said the department was pleased that the cooperative agreement had been signed. 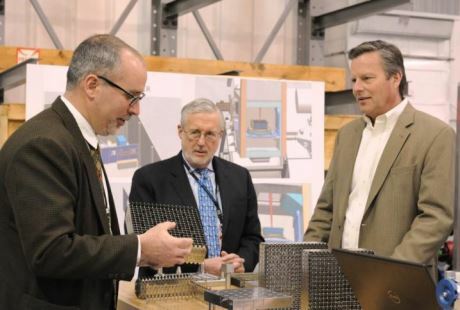 "Our work with B&W mPower will help advance the commercialization of safe and efficient SMRs in the United States," he said, adding that US-built SMRs could potentially support US energy and climate goals while boosting manufacturing capabilities and job growth. SMRs are smaller and simpler units than conventional nuclear power plants and could be used to generate power and process heat. They could offer advantages over larger units in various circumstances, such as where grid systems cannot cope with the load from a large nuclear power plant, or in remote locations. Large components could be manufactured remotely and transported to the operating site, where several modules could be sited together to provide a power station. A number of small reactor designs from 25 MWe up to around 300 MWe are in various stages of development around the world. The mPower is a 180 MWe integral pressurized water reactor concept which B&W claims offers benefits in terms of plant safety, security and economics. It would be factory assembled and freighted to a site where it would be fully bunkered in an underground containment building. The US Nuclear Regulatory Commission (NRC) has been involved in pre-application design certification discussions on the mPower reactor since 2009. A site at TVA's Clinch River in Tennessee has been earmarked for the construction of up to four units. Now that the cooperation agreement has been signed, geological characterization studies at the Clinch River site are expected to begin within six weeks, in accordance with a contract signed by TVA and B&W mPower in February. The mPower team will also work on a preliminary safety analysis report and environmental assessment, as well as the design certification application and an application for construction of the units. The construction permit application is expected to be submitted to the NRC in 2015.